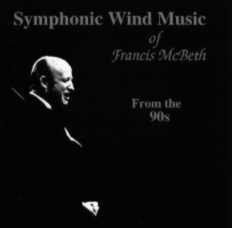 Harmoniemusik.net - Detailansicht des Komponisten MCBETH, FRANCIS W.
W. Francis McBeth wurde 1933 in Lubbock, Texas geboren. Er schrieb in den Gebieten der orchestralen, Kammer- und Bandmusik. Für seine dritte Symphonie wurde ihm 1963 in Rochester, New York der "Howard Hanson Prize" in Komposition verliehen. Er erhielt seine Ausbildung an der "Hardin-Simmons University", an der "University of Texas" und an der "Eastman School of Music". Herr McBeth ist der derzeitige Vorsitzende des "Department of Theory-Composition" an der "Ouachita University" in Arkadelphia, Arkansas. W. Francis McBeth was born 1933 in Lubbock, Texas. He has written extensively in the areas of orchestral, chamber and band music. Listed among the awards that he has received is the Howard Hanson Prize in composition, which was given to him in 1963 in Rochester, New York, for his Third Symphony. His formal training was acquired at Hardin-Simmons University, University of Texas and Eastman School of Music. Mr. McBeth is at present chairman of the Department of Theory-Composition at Ouchita University in Arkadelphia, Arkansas.